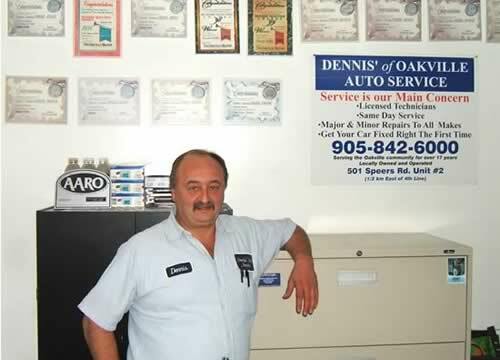 Dennis' Of Oakville.—Oakville car repairs,auto service,break repairs,emission test. Dennis of Oakville provides professional car repairs service for all makes and models of cars. Voted The Best Auto Service and Emission Test Shop in Oakville. 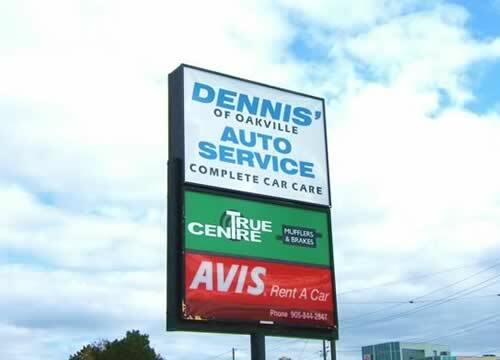 Dennis' of Oakville strives to provide high quality automotive service and car repairs for Oakville area. Dennis' of Oakville Auto Service as been proudly providing car repair services to Oakville residences since 1989. From serious repairs to oil change. Our main focus is Auto Service, and we want to fix your car right the first time. We have five licenced automotive technicians, and we offer same day service. We will: Conduct ourselves at all times with the honesty, integrity and skills associated with professionals. Stand behind our work and honour all guarantees and warranties associated with the services we provide and the products/parts we use. Recommend and perform only those services we deem to be in the best interests of our customers. Continuously update our knowledge to effectively meet the demands of new automotive technologies. Remember the hazy, lazy days of summer. Lying on the beach, cooling off in the water. Then walking back to the car, opening the door and being hit with the wall of super heated air. First thing is to start the car and put the air conditioning on full force. If you have an older car, the refrigerant used is likely freon or R-12. However, R-12, is partially responsible for depletion of the ozone layer. The refrigerant is no longer manufactured and its use is strictly controlled. If you have a failure with your air conditioning system, you will likely require a conversion kit to modify the type of freon used to a much less harmful R-134a. These conversions are reliable, and let you do your part to protect the environment. If any work is necessary, we will give you a choice of parts. A better grade of materials (pads for example) may be one of the best bargains around. They will last longer and perform better then standard grades. You are in control. Both here at Dennis' of Oakville Auto Service and on the road when the need arises. That's what makes us Oakville's Break Specialist. Did you know that the main cause of failed mufflers is simply a broken clamp? And that the cost of a clamp amounts to pocket change? If you're aware of this, chances are you already deal with us, because at Dennis' of Oakville Auto Service we believe an informed customer is a contented customer. We like to help take the mystery out of automotive repairs. Our clients really appreciate that. Besides, explaining about all of the "little extras" we provide is good for business. This alone won't prevent exhaust failures. But if you do require an exhaust system, we can help with that as well. And our mufflers come with a Warranty, of course. But our mufflers also come with something extra. They come with a little wiggle, too! Being part of a Muffler Chain, called True Center Muffler & Brake we have access to a warehouse, where we buy direct to get the best prices to pass the saving to our customers. When you need any muffler / exhaust work, give us a call, we an give you the best price for 1st line product made by Goerlich Exhaust, the Company that has made the first muffler in 1920 and is still building this product. We also offer custom pipe bending. If any work is necessary, we will give you a choice of parts. A better grade of materials (pads for example) may be one of the best bargains around. They will last longer and perform better then standard grades. You are in control. Both here at Dennis' of Oakville Auto Service and on the road when the need arises. Did you know that the main cause of failed mufflers is simply a broken clamp? And that the cost of a clamp amounts to pocket cLoss of control of any vehicle will endanger lives of others on the road. If you are concerned about your car, call us today at (905) 842-6000. We will carefully examine your car and give you the options you want to repair the situation. * Your vehicle "bottoming out"
Have you ever stopped to think how much contact your car actually has with the road? Your car (and YOU) stay on the road because of 4 hand-sized pieces of rubber compound. Let's keep your tires properly inflated and rotated. And let's replace your tires when the tread gets worn. But there's more to it than that. Your tires can also be an early warning system for other problems. Are they worn on only one side? An alignment will help to solve that problem and improve your car's fuel efficiency. Does your car shake a certain speeds? It may need a wheel balance. A very slight difference in the weight from one half of your tire to the other can create a powerful vibration at high speeds. Worn shocks can create other difficulties with your tires. Here at Dennis' of Oakville Auto Service, we like to see your tires and know what to look for. We will adjust your air pressure and check your tire wear.Bring them in for a visit. The technicians at Dennis' of Oakville Auto Service take the maintenance of automatic and standard transmissions very seriously. They know that regularly adjusting the bands and replacing the filter and fluid will ensure your transmission is cooperative when you ask it to propel your car forward, or to move it backward. And it won't wake your neighbours in the process. With our tender loving care, your transmission will operate smoothly, and quietly, too. Don't shift from Drive or Reverse to Park while the car is moving. Always bring it to a stop, and then shift. Check your fluid regularly. If you notice darkening in colour or if you see black specs in it, call us at (905) 842-6000. Let's check things out right away, before there's a big problem. If you tow anything with your car, pay careful attention to the gears you're using. Generally, you will want to avoid Overdrive. Adding a transmission fluid cooler to maintain the correct temperature may also be advisable. Most car manufacturers recommends to change transmission fluid and filter every 70.000 km. Most people forget. Here at Dennis' we will keep on top of it. Remember that transmission fluid & filter change costs approximately $120 - $150 for most cars. Transmission overhaul costs approximately $2.500 - $3.500 It makes sense to change your fluid every 70.000 km! Call us today, and together we'll make sure your transmission continues to move you ahead. Today's engines work better in part because of the computer-controlled electronics in your engine compartment. These complex components are designed to talk directly the scopes and diagnostic equipment here at Dennis' of Oakville Auto Service. Our trained technicians can interpret the readings, spotting small difficulties before they become expensive problems. Their technical expertise will ensure that your fuel efficiency is optimized, that your car is running reliably and no problems are looming. Never before has a tune-up been able to tell us so much about your car. Never has a tune-up been more necessary to automotive peace of mind. Phone us at (905) 842-6000 and have one of our skilled technicians schedule a tune-up appointment for you! Or if you need any tune-up or electrical diagnostic work done, we are also a Drive Clean test & repair diagnostic center, as part of our Oakville auto repairs services. When you receive the notice saying your car must pass the Ontario Drive Clean emissions test before you can get your new license plate sticker ... relax. 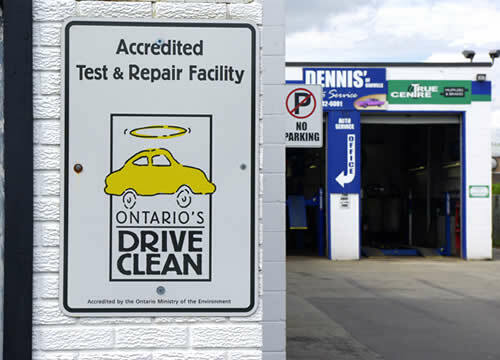 Dennis' of Oakville Auto Service is an accredited Drive Clean test & repair facility. We'll make the inspection trouble-free for you, and have you on your way without delay. A Drive Clean-certified technician will ease your vehicle onto a dynamometer, a kind of treadmill. One end of an exhaust hose is inserted into your car's tailpipe, the other to a machine that measures the output of pollutants like nitrogen oxides, hydrocarbons and carbon monoxide. The dynamometer's treadmill will then be engaged to simulate driving conditions during which your car is tested and compared to emission standards for its year, make and model, with some allowances made for its actual age. The test results interface with a super computer at the Ministry of Transportation, and are recorded on a printed form - a copy of which we sign and give to you. That's it. Done! While it may sound complicated, the Drive Clean test is a routine undertaking for the skilled technicians at Dennis' of Oakville Auto Service. And at only $35.00, it's affordable for every motorist, and a small price we can all pay to help safeguard our environment. Are you familiar with the shocking statistics concerning pollution that were released by the Ontario Medical Association (OMA)? They say air pollutants in Ontario kill 1900 people, and result in 9,800 hospital admissions, 13,000 emergency room visits and 47 million sick days for employees. That's in only one year! And they found a particularly strong correlation between occurrences of childhood asthma and exposure to pollutants from motor vehicles. It's all so very tragic and sad. Findings like those in the OMA study make all of us here at Dennis' of Oakville Auto Service proud to represent Ontario's Drive Clean Program in the Oakville area. We hope to make the Drive Clean experience an easy one for you. Please call us to schedule a convenient time for your vehicle's test soon after receiving the notice from the Ministry of Transportation. That way we can all breathe a little easier. Please call for an appointment for your next emission test in Oakville. When you receive the notice saying your car must pass the Ontario Drive Clean emissions test before you can get your new liWe are actively involved in the Oakville community. If you have children or grandchildren in minor sports, you've probably noticed the name 'Dennis' of Oakville Auto Service' on team sweaters. Supporting the fabric of one's community is what independent business is all "about". And are we ever proud of the young ones. They are our future. Independent business contributes to the quality of life in Oakville in a way that huge corporations cannot. Helping children develop the necessary skills to grow and take their place in society is a part of what Dennis' of Oakville Auto Service is all about. So, if you are in the stands at a youth game, and see Dennis' of Oakville Auto Service working as a team, cheer loudly for the kids, and give an extra cheer for yourself since you are contributing to their development. Stay with whom you trust. We at Dennis' of Oakville Auto Service proceed with only the work you approve, using only the quality parts that you accept. If we think using parts from an auto recycler is a viable alternative, we will advise you of this option. However, you have the choice, and YOU make the decision. Not some claims adjuster in... well who knows where. Many people will say that the "Insurance company recommended garages" got their preferred status based on the number of corners they're willing to cut. My name is Dennis Ciaccia. I am proud of the work that my team does here at Dennis' of Oakville Auto Service. If your car is important to you and if it is important that it continues to run the way it did before the difficulties, call me at (905) 842-6000. I will help you with the insurance paperwork, and I can speak to your claims adjuster if need be. My team will fix it right. The way you want it fixed! After all, it is your car and it is you who should make these decisions. If a warranty came with your Used Car, rest assured that Dennis' of Oakville Auto Service will fix it right, and arrange to bill your Warranty company directly. Other than your deductible, or a portion of the repair that might not be covered by your warranty, you will never see a bill! Before we begin any work, we will arrange pre-approval from your warranty company, discuss any concerns we may have with you, and only then will we proceed. You are ensured a professional repair, your car back on time and fixed right and, of course, no surprises. Regardless of what the automotive dealer's salesperson told you, the trained professionals at Dennis' of Oakville Auto Service are able to maintain or repair your car under the warranty. In fact, more cars are maintained by their favourite Independent garage than by the new or used car dealers. Why? Our customers tell us it is because the work is done right, it is completed on time and that the technicians at Dennis' of Oakville Auto Service 'know me, know my driving habits, and know cars'! Don't sacrifice quality service when shopping for a car! Stay with the people that know you at Dennis' of Oakville Auto Service. And keep your Used Car Warranty, too! Stick with the neighbourhood professionals you have grown to know and trust at Dennis' of Oakville Auto Service. Trained and certified to keep your new car running showroom smooth, our skilled technicians are your best choice for top-quality maintenance and service. The reason is a basic one. Year after year, surveys disclose that Independents rank No. 1 when it comes to auto repair and customer satisfaction. 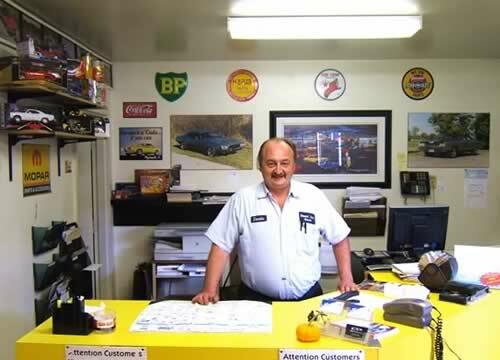 Here at Dennis' of Oakville Auto Service, our customers tell us it is because the work is done right, it is finished on time, and moreover, the technicians "know me, know my driving habits ... and know cars"! Why settle for less? Stick with the people in your community that know you, and know cars - the neighbourhood professionals at Dennis' of Oakville Auto Service. Dennis' of Oakville. | Oakville, Mississauga, Toronto, GTA. 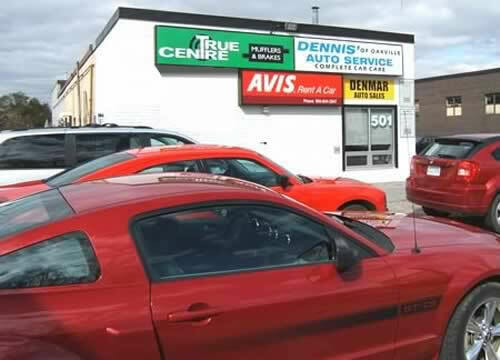 Dennis' of Oakville provides professional auto repairs for all makes and models. Regular hours of Operation 8am to 5pm Mon-Fri, starting Aug 8 / 2016 forward.